In only 6 days, the film has grossed over 300 million at the box office – and that number is climbing every day. The strange thing is that Chinese films don’t normally sell so well – especially animated ones. The movie, though at first looking like it would only appeal to kids, now has people from all age groups running to see it. 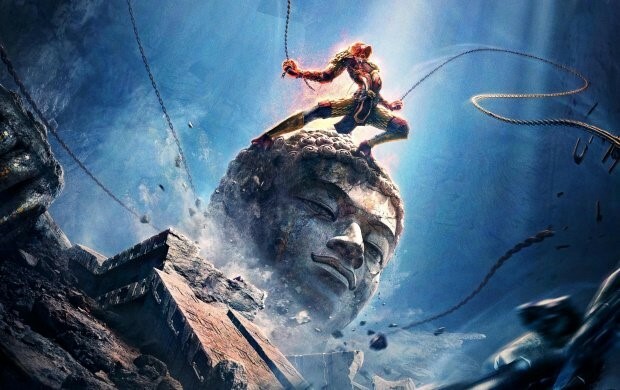 The plot is very loosely based on the 16th Century Chinese literary classic Journey to the West (xī yóu jì) and contains some of the epic novel’s most famous characters. If you aren’t familiar with Journey to the West then this movie is a great way to familiarise yourself with the following characters. Going to China and not knowing these characters would like a Chinese person going to Britain and not knowing about Romeo and Juliet. The Monkey King (sūn wù kōng), is the dà shèng 大圣 referenced in the title of the movie. He is powerful enough to fight the gods, and leaps around punching and kicking at lightning speed. Unfortunately because of his bad behaviour his powers have been limited by the Buddha who placed an amulet around his wrist. The monkey king is still formidable in battle but due to the amulet he is unable to unleash his full strength. The Pig (zhū bā jiè) is the focus of ridicule throughout the novel and this movie. He is basically a shape-shifting pig man, with the on-going joke being that his shape-shifting powers are really bad. For example he will shape shift into another character and look exactly like them except for the small problem of his giant pig nose remaining. At one point in the movie he threatens to turn into a powerful character from Chinese mythology but unintentionally turns himself into a domestic cat instead. The Earth Gods (tǔ dì gōng) appear in this movie following the main characters around at various points. Although they don’t play a significant role it is an interesting cultural reference, and even today you can see incense sticks left in the ground in some of the older residential areas, particularly in rural areas, as people (usually the older generation) worship these gods. As a kids movie the plot is quite simple; a young monk (actually just a child) tries to protect a baby from being abducted by demons. In the process he accidently stumbles upon and awakens the monkey king, who has been sealed away in a mountain by the Buddha. At first the monkey king isn’t too happy to help the child, but then the kid helps defeat a rock monster sent to keep him in the mountain, after which the monkey king gradually warms to the child. The plot is simple but entertaining, and seems very much like a Chinese attempt at doing a kung-fu panda style movie. On all levels it seems to succeed. The animation is great and for the Mandarin student the dialogue, along with the plot, are fairly simple and shouldn’t be a problem. The movie, after all, is originally intended for Children. 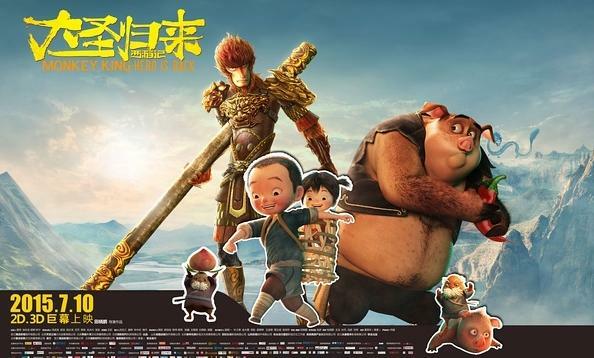 This entry was posted in movie of the month and tagged animated chinese movies, da sheng gui lai, monkey king hero is back. Bookmark the permalink.